Used Craigslist Rideshare to find One Buck Chuck to taxi us to the airport ($18), flew Frontier Air ($63) to Cabo San Lucas…no wait, San Jose del Cabo. Hilarity ensues. What did we lose today? iPad. Andrew left the iPad in the pocket of the back of the seat in front of him on the plane. Andrew writes:Being a retiree, I’m just not used to getting up at oh-dark-thirty anymore. We were too rushed to make coffee even, which didn’t help matters. By 0530hrs, I was sitting outside on the front steps waiting for “One Buck Chuck” to roll up. His real name is Will, and I found his services on Craigslist. At $1/mile, he was half the price of the next nearest competitor. Plus, he had a minivan! So Will rolls up a couple of minutes late, which is no big thing since we’ve allowed lots of time to get to the airport. We hit a small snag; he doesn’t have fold down seats in his mini van, and our bicycles won’t fit in the back. Well, they will, except we need to remove a row of his seats, and we put them in front of the garage. Will says he’ll swing by to get them after he drops us off at the airport. I take note of the lack of a license plate, and the gigantic dent in the front quarter of Will’s van, and wonder if he stole it. It turns out, he lives in the van, which, being homeless myself, doesn’t really phase me much. We make small-talk all the way to the airport. I’m glad that we chose to take a taxi, instead of try and cycle there. It would’ve been a long ride in the dark, with LOTS of traffic. The next phase in the clusterf**k of our day is trying to check in. I find a giant cart to put the bikes, and our bags on, and Amanda goes and stands in the huge lineup for the “bag drop”. Ok, so checking-in was a breeze, as it was all done at a small computer kiosk. Every 2 minutes though, an airport employee, or airline employee, or both, shows up to drive my luggage cart away as they think it’s checked-in oversize luggage. Picture me on one end, pushing back against some guy on the other end, each grimly determined to get our own way. When Amanda finally gets to the front of the line, the rest of the check-in was pretty smooth too. All of the time we spent last night to ensure our backs were underweight was worthwhile, and they checked in at 50, 49 and 47lbs respectively. Then we set off for the gate, pausing along the way for an hour in the security lineup, before finally getting coffee into our system at 0745hrs. We take a few breaths, inhaling our coffee with much gusto. Our boarding time comes and goes, and we don’t sweat it. Unlike pretty much everyone else in the terminal, we’re never in a hurry to get anywhere. Then an announcement comes over the public address that our original plane required maintenance, and so we were being moved to another gate down the hall. We saunter over, and after about an hour delay, we get to board our plane to Cabo San Lucas. As far as “budget” airlines go, Frontier is alright. The seats were comfortable. We didn’t have any screaming children around us. Sure there were no TV’s, but we have our iPad. The flight itself was pretty chill. 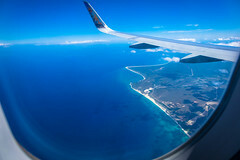 We arrive at the airport and we breeze through customs, since we appeared to be the first flight to land today. 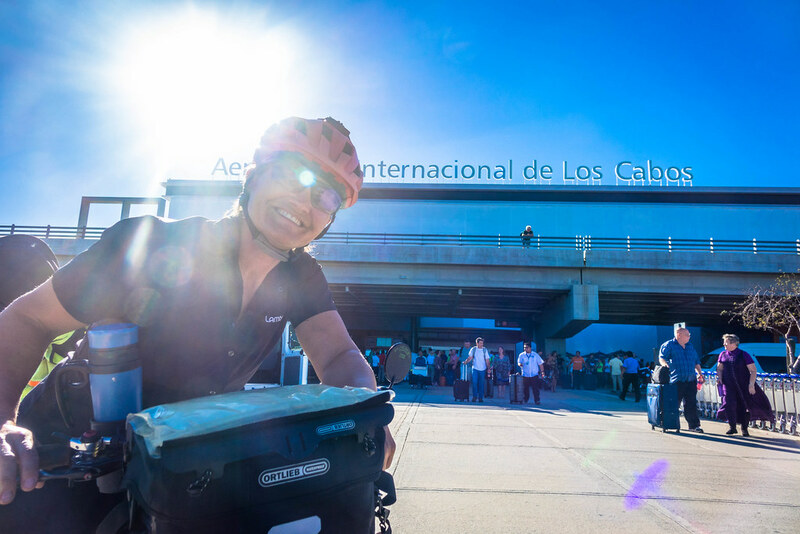 I set off to find our bicycles, while Amanda grabs our gear from the baggage carousel. Nothing appears to be damaged or missing, and so I build the bikes back together, which since it was just a matter of attaching pedals, and pumping air into the tires, didn’t take any time at all. Still, it all takes time, maybe an hour and a bit. Then I’m putting my bags onto the bike and suddenly realize that I don’t have the iPad. Amanda didn’t have it either. I remember leaving it on the seat in the airplane. Damn. Ok, so I stand in line at the Lost Luggage counter, where surprisingly, about half a dozen people from our flight actually lost their luggage (?). After an hour, the iPad is located, and we’re ready to go. There’s only one problem. We aren’t in Cabo San Lucas. Even though our ticket says Cabo San Lucas on it, the main airport in the area is actually in San Jose del Cabo, which is about 40km away. Not really an issue when you’re taking a taxi to your resort, but for us, it was already late in the afternoon, and the sun was due to set soon. I had arranged for couch surfing tonight in Cabo San Lucas, and we clearly weren’t going to make it there. Instead, we just started riding out of the airport, towards downtown, and ended up choosing a roadside hotel and called it a night. There was a place where we got some tacos across the street, and it was nice being able to get our bearings for riding out of here tomorrow. I’m just glad that today is done! Let the lack of planning and this impulsive decision begin. All of my planning included riding for another couple of weeks in the USA and I left the Baja Mexico planning to Andrew. After taking the extra time to get the iPad back and realizing we weren’t where Andrew thought we’d be, I was just spent. I sat down in a corner of the airport waiting for Andrew to figure out what was next and rather than actually verbally communicating with me, he sends me a message online saying “sorry about all this”. I didn’t get the message until later that night at the hotel and was just left wondering if this is what our communication has come to. He messages me while we’re sitting beside each other rather than saying the words to me. At the end of the day it was good to be sleeping in a safe place beside Andrew … frustrating as hell but safe. Peachy the Fox, flying us over Baja, Mexico. Whew…..so glad you are both safe and sound,,,,looking forward to your Cabos San Lucas updates and Merry Christmas to you both!